Cooking for someone with a wheat allergy or sensitivity is never easy, but it’s particularly trying during the holidays. 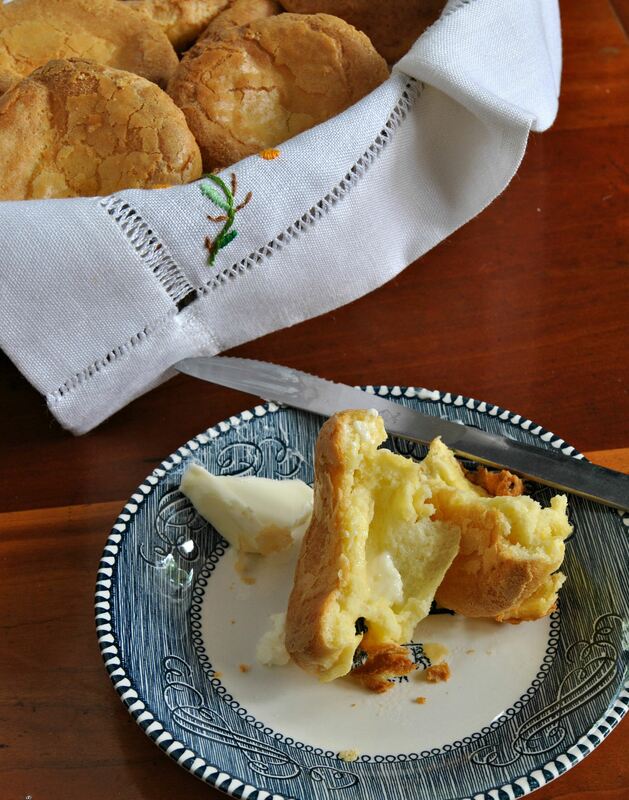 So much of what we love to serve at our Thanksgiving table is chock-full of gluten — from the buttery crust on the pumpkin pie, to the giblet gravy, to the fresh-from-the-oven bread and rolls that are essential for scooping bits and pieces off the plate. And stuffing. Thanksgiving dinner for many of us just wouldn’t be Thanksgiving dinner without the glorious bread-and-herb mixture we stuff inside the turkey’s cavity to absorb those delicious juices the bird releases during cooking. You can go the vegetarian route, of course, substituting a medley of salads and vegetables for the traditional sides. But somehow, filling up on green beans and sweet potatoes isn’t as satisfying. Daresay you might even feel cheated. The good news is that with a little imagination and help from the many gluten-free products so readily available these days, even at small supermarkets, you don’t have to deny those with celiac disease or wheat sensitivities the centerpiece dishes they once loved. It’s a similar story with stuffing. Swap the wheat-based bread cubes for ones made from gluten-free cornbread, and you won’t miss a beat. Gluten-free cornbread is surprisingly delicious, especially if you pair it with spicy chili peppers and another Thanksgiving favorite, corn. Tired of green beans? 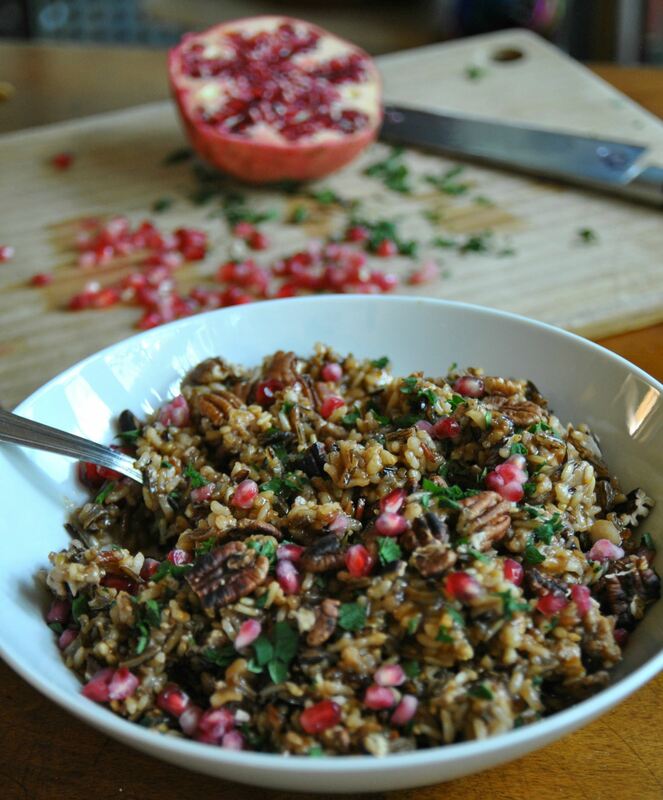 Wild rice paired with chorizo, toasted walnuts and crunchy pomegranate seeds is not just extremely flavorful, but also a feast for the eyes. But the best part of this gluten-free story is dessert. Who doesn’t love cheesecake? Crazy people, that’s who, or maybe just those with wheat sensitivities who don’t know you can make just as delicious a crust with gluten-free flour instead of the usual graham cracker crumbs. You just need a little xantham gum to bind it together. A few words of caution if you’re cooking for someone’s who living a gluten-free lifestyle: Be sure to keep the kitchen counters, pans and utensils clean so you don’t cross contaminate dishes, and always label leftovers. After such a lovely celebration, it’d be a real bummer to give your guests a tummy ache. — Gretchen McKay: gmckay@post-gazette.com, 412-263-1419 or on Twitter @gtmckay. The crown-topped popovers are crisp on the outside and the moist inside. Preheat oven to 400 degrees. Grease a 12-cup popover pan or standard muffin pan. In blender or large bowl, whisk together eggs, butter, and milk until the mixture is uniform. Whisk the flour or flour blend in a bowl with the xanthan gum and salt. Spoon or pour the dry ingredients into the blender/bowl, and whisk until you have a smooth batter. Pour the batter into the prepared pan, filling each cup about ⅔ full. Bake for 25 minutes, then reduce the oven heat to 350 degrees and bake for an additional 15 minutes, until the popovers are deep brown. Makes 12 standard (muffin-sized) popovers. 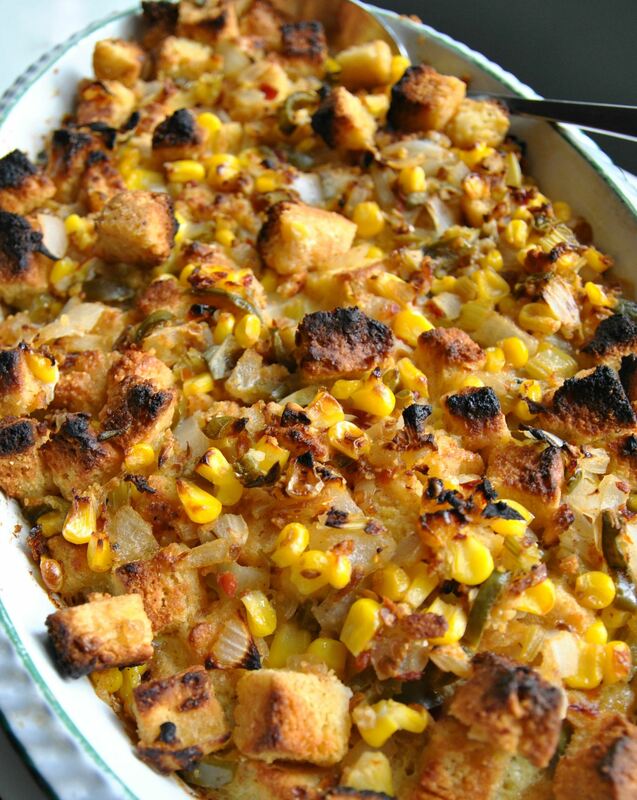 This stuffing is spicy, so if you’re not a big fan of heat, you might want to cut back on the amount of chili peppers. Or not: my son, Jack, ate the entire casserole in less than 24 hours. Cut cooled cornbread into 1/2-inch cubes. Melt butter in skillet over medium-high heat. Toast cornbread and transfer to greased casserole dish. In same skillet, saute celery, onion and garlic until translucent. Season with salt and pepper. Add vegetables, peppers, sage and corn. In bowl, combine stock and eggs and pour over the cornbread mixture. Gently fold to combine. Cover, place in oven and bake for 35 minutes. Uncover dish and broil for about 5 minutes, until golden brown. Serve hot. Be sure to soak the rice or it will take forever to cook on the stove. To remove the ruby-red pomegranate seeds, roll the fruit before cutting in half to loosen the seeds, then tap the halves with a wooden spoon over a bowl. I substituted pecans for the walnuts; toasted almonds would be delicious, too. Place rice in large bowl and cover with water. Let sit at room temperature for 12 hours or overnight. In large pot over medium heat, warm 3 tablespoons olive oil until hot but not smoking. Add shallots and garlic, season with salt and pepper, and cook until translucent, about 5 minutes. Stir in molasses and tomato paste. Drain rice and add to pan along with thyme and bay leaf. Cook until rice smells toasty, about 2 minutes. Pour in 3 cups water and bring to boil. Season with more salt, lower heat and simmer, uncovered, until liquid is almost gone, about 40 minutes. (The grains will be splitting open and beginning to unfurl but not completely softened.) Remove from heat, cover and allow rice to steam for 15 minutes. Remove bay leaf. Fluff rice with wooden spoon. In small, dry frying pan over medium heat, toast walnuts until fragrant, 3 to 5 minutes. Cool. In large frying pan over medium-high heat, warm remaining 2 tablespoons olive oil until hot, but not smoking. Add chorizo and cook, without stirring, until browned on one side, 2 to 3 minutes. Use wooden spoon to break up the browned sausage into thumbnail-sized pieces. When sausage is almost cooked through but still pink, add to rice. Add stock. Return pot to stove and cook over high heat until stock has almost evaporated. Season with salt and pepper and garnish with parsley, pomegranate seeds and toasted walnuts. Spike the dish with vinegar and serve warm. — “Gjelina: Cooking from Venice, California” by Travis Lett (Chronicle, 2015, $35). Make crust: Adjust oven racks to upper-middle and lower-middle positions and heat oven to 325 degrees. Brush bottom of a 10-inch springform pan with ½ tablespoon butter. In large bowl, whisk flour, sugar, salt and xanthan gum until combined. Whisk in 5 tablespoons butter until fully incorporated and mixture resembles wet sand. Using your hands, press crumb mixture evenly into pan bottom. Using bottom of dry measuring cup, firmly pack crust into pan. Bake on lower rack until edges begin to darken and crust is firm on top, 22 to 25 minutes. Let cool completely. Reduce oven to 200 degrees. Make filling: In stand mixer, beat cream cheese, ¾ cup sugar and salt at medium-low speed until combined, about 1 minute. Beat in remaining 3/4 cup sugar until well combined, about 1 minute. Add sour cream, lemon juice and vanilla and beat at low speed until combined, about 1 minute. Add egg yolks and beat at medium-slow speed until thoroughly combined, about 1 minute. Scrape beater and bowl. Add whole eggs, 2 at a time, beating until thoroughly combined, about 30 seconds after each addition. Strain filling through fine-mesh strainer into bowl. Brush sides of springform pan with remaining ½ tablespoon melted butter. Pour filling into crust and set aside for 10 minutes to allow air bubbles to rise to top. Gently draw tines of fork across surface of cake to pop air bubbles that have risen to surface. When oven registers 200 degrees, bake cheesecake on lower rack for 45 minutes. Remove cake form oven and use toothpick to pierce any bubbles that have risen to surface. Return to oven and continue to bake until center registers 165 degrees, 2¼ to 2¾ hours longer. Remove cake from oven and increase oven temperature to 500 degrees. 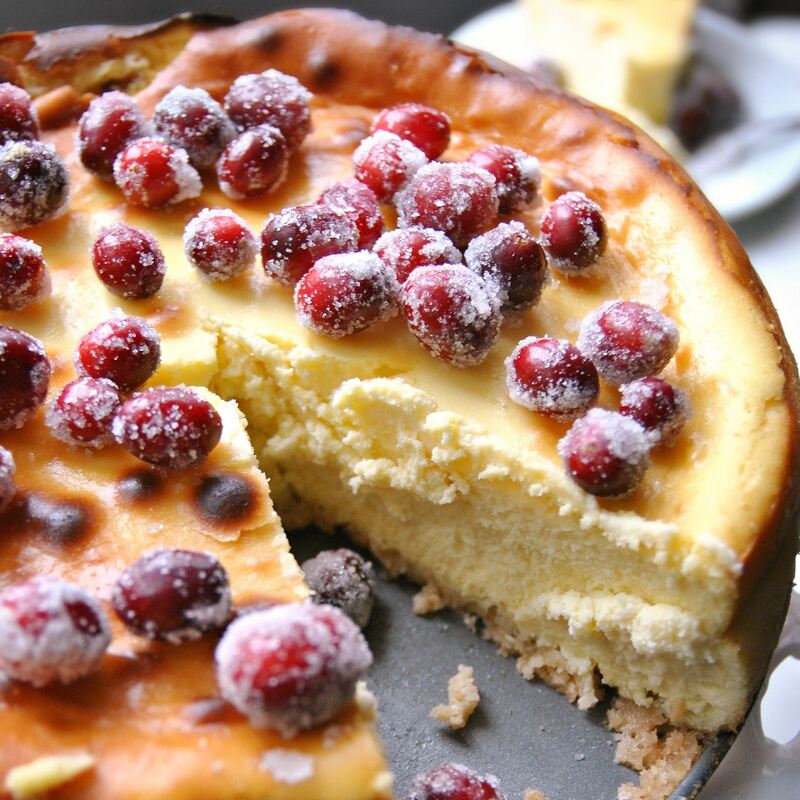 When oven is hot, bake cheesecake on upper rack until top is evenly browned, 4 to 12 minutes. Let cool for 5 minutes, then run thin knife between cheesecake and pan. Let cool until barely warm, 3 hours. Wrap tightly in plastic wrap and refrigerate until cold and firmly set, at least 6 hours. To unmold, remove sides of pan. Slide thin metal spatula between crust and pan bottom to loosen, then slide cheesecake onto serving plate. — “The How Can it Be Gluten Free Cookbook Volume 2” by American’s Test Kitchen (October 2015, $26.95).